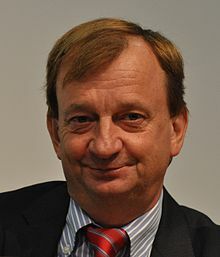 Harry Juhani "Hjallis" Harkimo is a Finnish businessman, sportsperson and a member of the Finnish Parliament, representing the National Coalition Party. Harkimo is the chairman of the board of the Helsinki-based ice-hockey team Jokerit. He is also the developer of the team's home arena, Hartwall Areena, and an investor in sports. Harkimo has also hosted Finnish version of The Apprentice in 2009 and 2010. Harry Juhani "Hjallis" Harkimo (born 2 November 1953 in Helsinki) is a Finnish businessman, sportsperson and a member of the Finnish Parliament, representing the National Coalition Party. Harkimo is the chairman of the board of the Helsinki-based ice-hockey team Jokerit. He is also the developer of the team's home arena, Hartwall Areena, and an investor in sports. Harkimo has also hosted Finnish version of The Apprentice in 2009 and 2010. Harkimo was elected to the parliament in 2015, gaining 11,416 votes in the elections. He has also been a professional sailor and a sports manager. In 1986–1987 he took part of round-the-world single-handed yacht race BOC Challenge and finished third.